In order to educate ourselves, we have been working with and learning from scientists. The plum tree with its blazing public presence, its saturation with plant and insect knowing, and its sheer beauty set off a series of thoughts around bees, art, and science which I am still working through. About the same time as my plum tree was blooming, as part of our bee project and in the interests of educating myself, I attended two science-focussed events, one a pollinator symposium by the Entomological Society of British Columbia and the other a Citizen Science training workshop on bee identification. The bee identification workshop took me down that familiar path to wonder and awe. 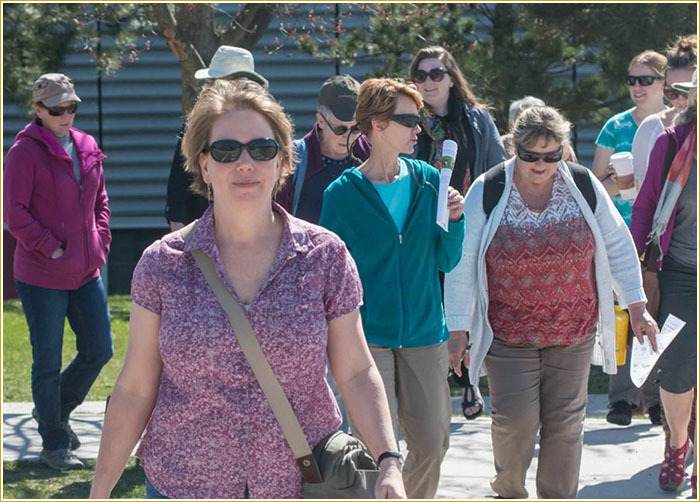 Dr. Elizabeth Elle leading a Citizen Science group on the UBC Okanagan campus, April 2016. Along with 24 others, I spent a day with Dr. Elizabeth Elle where we attempted to recognize the myriad types of bees and bee-lookalikes. Dr. Elle is a remarkable scientist who started out as a botanist studying pollination. She soon realized that in order to know the most she could about pollination, she would have to learn about bees.